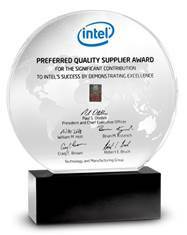 Portland, Oregon, March 10, 2016 – Tosoh Quartz, Inc. has been recognized as one of 26 companies receiving Intel Corporation’s Preferred Quality Supplier (PQS) award for their performance in 2015. Tosoh Quartz, Inc. has demonstrated industry-leading commitment across all critical focus areas on which they are measured: quality, cost, availability, technology, customer service, labor and ethics systems and environmental sustainability. Tosoh Quartz, Inc. is recognized for their significant contributions providing Intel with Quartzware for semiconductor wafer processing equipment, deemed essential to Intel’s success. "Tosoh Quartz, Inc. continues to support Intel with commitment to quality, technology and availability," said Tim Hendry, vice president and director of fab materials in the Technology and Manufacturing Group at Intel. "Tosoh Quartz consistently provides excellent engineering support and leading technology. This award recognizes them as a world class supplier for Quartz development. Congratulations!" A celebration to honor PQS award winners was held in Santa Clara, California themed “Delivering the Future Together”, which illustrates the contributions this supplier has made in 2015. In addition, there was an announcement on Intel’s website at https://newsroom.intel.com/. About the Supplier: Tosoh Quartz, Inc. is an industry leader in the production of quartz glass products for use by the semiconductor industry in the manufacture of integrated circuits. Tosoh Quartz, Inc. has been operating in Portland, Oregon, since 1970 and in Durham, England, since 1993, and is a member of Tosoh Corporation’s Advanced Materials Division, which includes Tosoh Quartz Corporation (Japan), Tosoh Quartz Co., Ltd.(Taiwan), Tosoh SMD, Inc. (United States, Korea, Taiwan, China), Tosoh Speciality Materials Corporation (Japan) and Tosoh SGM Corporation (Japan). Tosoh Corporation is the parent of the Tosoh Group, which comprises over 100 companies worldwide and a multiethnic workforce of over 11,000 people. Since its founding in 1935, Tosoh has built balanced product lines of commodity chemicals for industry and of specialty products for niche markets. Tosoh is one of the largest chlor-alkali manufacturers in Asia. The company supplies the plastic resins and an array of the basic chemicals that support modern life. Tosoh’s petrochemical operations supply ethylene, polyethylene, and functional polymers, while its advanced materials business serves the global semiconductor, display, and solar industries. Tosoh has also pioneered sophisticated bioscience systems that are used for the monitoring of life-threatening diseases. In addition, Tosoh demonstrates its commitment to a sustainable future in part by manufacturing a variety of eco-products.